Combination of cards needed for Mother's Day Weekend. We were invited to a Birthday and Mother's Day Celebration Party of some friends down the street. I have no cards in my stash, so I had no choice but to try to whip up multiple cards for the friends that would be attending the small gathering as well as one for the Birthday Boy of the day too. Well, when I went looking for the pictures to post for this entry, I guess I forgot to take a pic of one of the Mother's day cards. The card in which I cannot find photo for is a card using the retired Manhattan Floral Embossing Folder by Stampin' Up which I embossed on some shiny white paper and cut it out and then popped it onto a colored card and it was stamped with a Happy Mother's Day sentiment. I was able to find the photos of the other cards needed for the day's festivities. 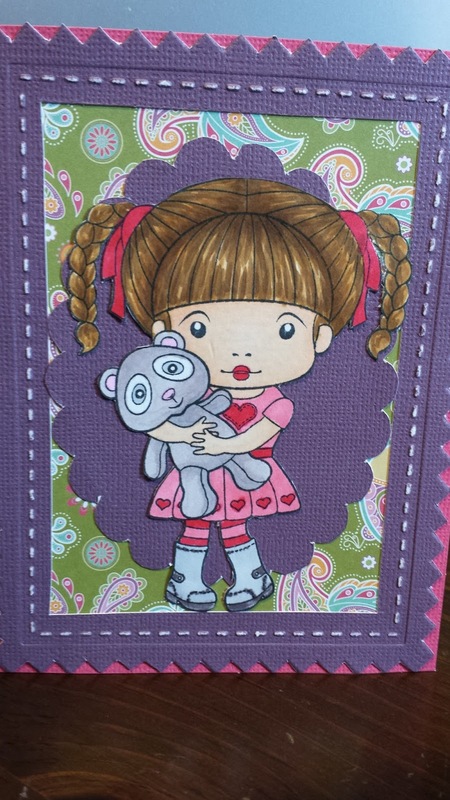 This card is made up of the La La Land Crafts Sweet Friends Marci stamp colored with Spectrum Noir Markers, SpellBinder's Oblong Scallop, and a Frame Emboss Folder which was cut out to frame the card. 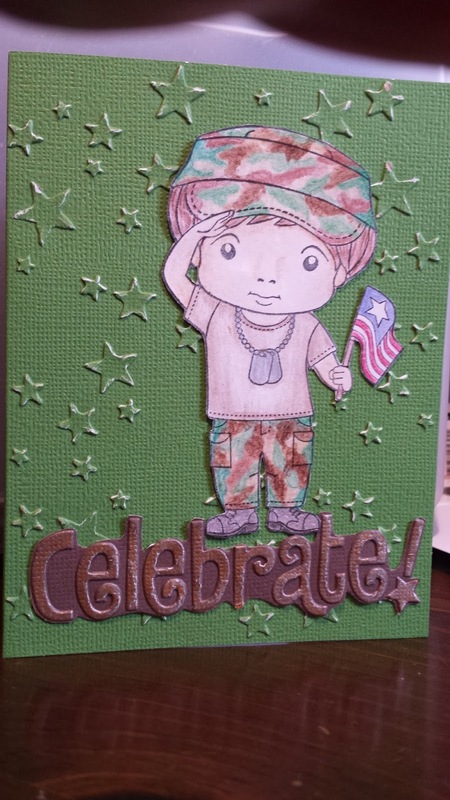 Card below is made up of the La La Land Crafts Saluting Luka which was colored with colored pencils. It was my second attempt of camouflage. It's an improvement from my first attempt, but I still have a ways to go before I will master the camo look. 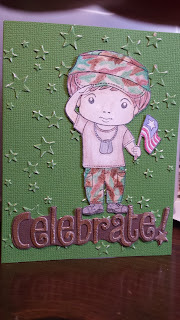 The green cardstock starry background is the Sizzix Tim Holtz Alterations Stars Embossing Folder. The card's sentiment Celebrate! is from Darice's Birthday Embossing Folder Boarders Set. Celebrate! sentiment was embossed on brown paper and colored it with a Metallic Copper Bronze Pen. Since this a retired Marine friend, a Birthday salute would be an awesome fit. I thought of a cute little saying to put inside the card to mention the lil' gift of the 24 pack of beer we were giving him. The inside saying said - A special salute for you on this special day.... a 24 can salute is being done in your honor to celebrate your special day. Here is to ya good buddy! followed by a Happy Birthday greeting. He loved it! He laughed at how I personalized the salute. I am so glad that I could make his day a bit more special than it already was. It's amazing what a card can do. It is also amazing to see what personalizing the card can do too. Thanks for stopping in to view my latest creations. I hope you have a happy scrappy day!